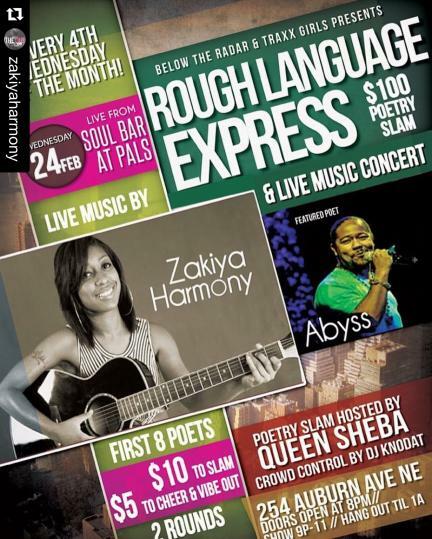 You can’t get better than live music and poetry! -Every LAST Wednesday of the month poets can win $100 at ROUGH LANGUAGE EXPRESS, then move on the bigger quarterly poetry slam in April and Sept for $500 – then the GRAND SLAM is in December for $1,000! -Poets can win cash every month. There is no limit to how many times you can win the cash. However, once a poet has secured their spot in the quarterly slam the 2nd place monthly winner will get the opportunity to get a DISCOUNTED registration fee for the quarterly slam. -The monthly poetry slam registration is only $10 to win $100. First place cash prize only, 2nd and 3rd MAY received gifted or sponsored prizes. First 10 poets only. Any poets after 10 can perform on the open mic, segment of the show. -The registration for the quarterly $500 poetry slams is $35. First place cash prize only, 2nd and 3rd MAY received gifted or sponsored prizes. Open to 12 poets from anywhere – + the 3 monthly winners. -The registration for the $1,000 grand slam is $75. $500 to first place $300 to second place and $200 to 3rd place. By invitation or online submission + the two $500 winners from April and September. -There is always a musical performance or two before the poetry slam. *We keep the cost of admission low, so everyone can come out and enjoy a high class show. The monthly slams are held at Pals Lounge and the quarterly slams in April and December are held at Apache Cafe and the slam in Sept is always the SUN-DAY (day event) during brunch of Labor Day weekend. *Rough Language, in it’s evolution, is going on 16 years; originated in Norfolk, VA as The Word Fair, then Word Up! and has been in Atlanta, Philly and Detroit as Rough Language. Every single show sells out – no kidding! Get your tickets early for all upcoming shows. *Live Music performers announced on social media every month!